Extra heavy duty, high horsepower Bondioli & Pavesi gearboxes with oil level sight glass and 4.45 mm (1 3/4") input shafts and 75mm (3”) output shafts, 260 HP divider, 210 HP centre & wings. Bondioli & Pavesi G8 drive lines with high-torque wing clutches give better performance in rough cutting. A deep cutting chamber coupled with high blade tip speeds result in a superior cut & unsurpassed material flow. 610mm (24") severe duty tyres, transport height of 444mm (17 1/2") along with superior performance in wet conditions. Lower pressure 200mm (8") stroke hydraulic phasing cylinders for a level lift for an even cut. Low maintenance constant velocity tractor shaft requires weekly, rather than daily service. Centre suspension reduces stress on tractor drawbar. 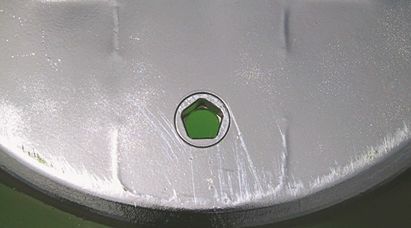 10mm (3/8”) thick formed deck protection rings prevent blade to deck contact. Double safety chains with individually replaceable links are standard equipment. Single domed, sweep clean deck design eliminates excess weight over competitive double deck designs, eliminates build-up of debris & prevents rusting on top side of deck. Tandem walking axles result in smooth operation over rough surfaces. 35mm (1/4”) thick stump jumpers with Pentagon Blade Bolt design allow cutter sections to ride over obstructions. 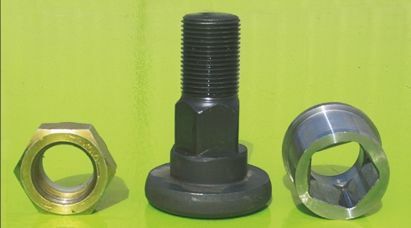 Replaceable spring steel bushings in the hitch pivots, main pivots, tension link pivots, suspension pivots and the centre and outside wheel standard main pivots. 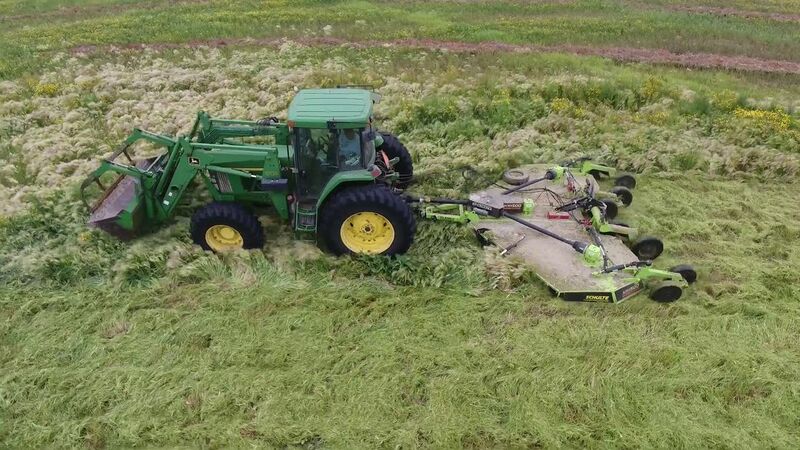 Increased blade tip speeds and greater space under the deck contribute to clean cutting in all conditions. 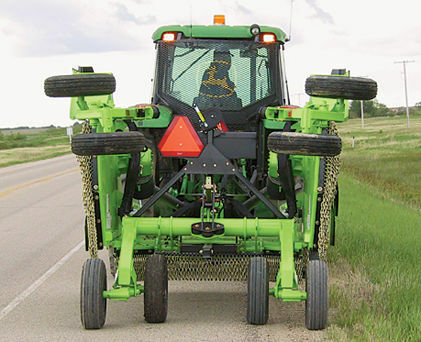 The centre suspension system reduces stress to the rotary cutter and the tractor. Industry leading transport clearance improves performance in rough terrain. 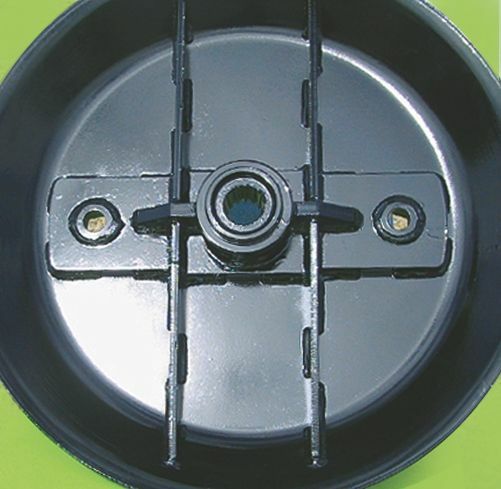 Our stump jump pans protect your machine and are built to last. Replaceable bushings for the blade bolts. 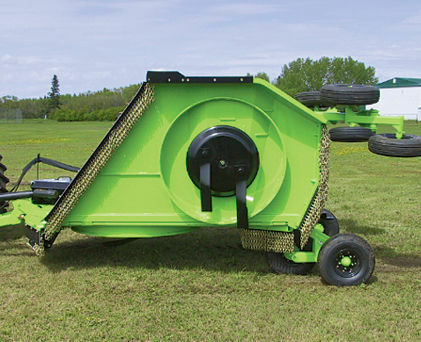 Optional hitch configurations to suit your tractor and conditions.